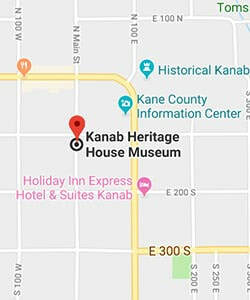 We encourage everyone to stop by and experience the history of Kanab. ​In addition to free guided tours, the Heritage House also hosts a variety of lectures, demonstrations and events that are open to the public. Free tours are available during all open hours. Tours during CLOSED hours are available by reservation. To reserve a private tour, please contact us. Please check the calendar below for special events and closures. ​'Redbrick & Gingerbread' exterior home tour.